sri lankan spicy breakfast omelet(family favorite). 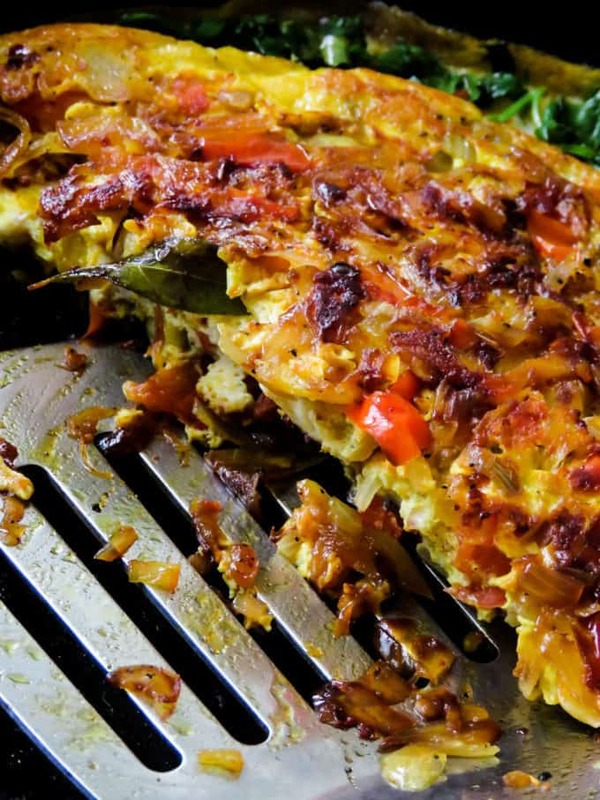 Eggs are a favorite ingredient around here and one easy breakfast skillet dish I like to make for myself and the kids is this delicious spicy omelet. The best part of this recipe is that you probably have all the ingredients in your pantry right now just to give it a test run. A recipe to stick on your refrigerator door so the kids or that husband of yours who has no idea what to do in the kitchen can make when you are not around. 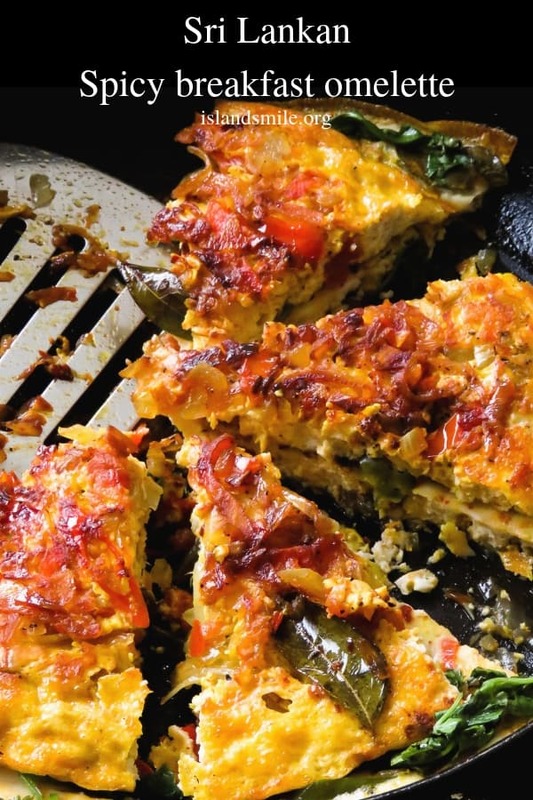 I say breakfast but this spicy omelet is so filling, it can be a meal for one person or a quick brunch idea. Add extra slices of onions and tomatoes over toasted bread, use any kind of spread on the bread with a few slices of avocado to make an elegant open sandwich. Don’t forget, omelets can be made ahead and warmed at the time of serving which helps when you have sleepy heads in the family. 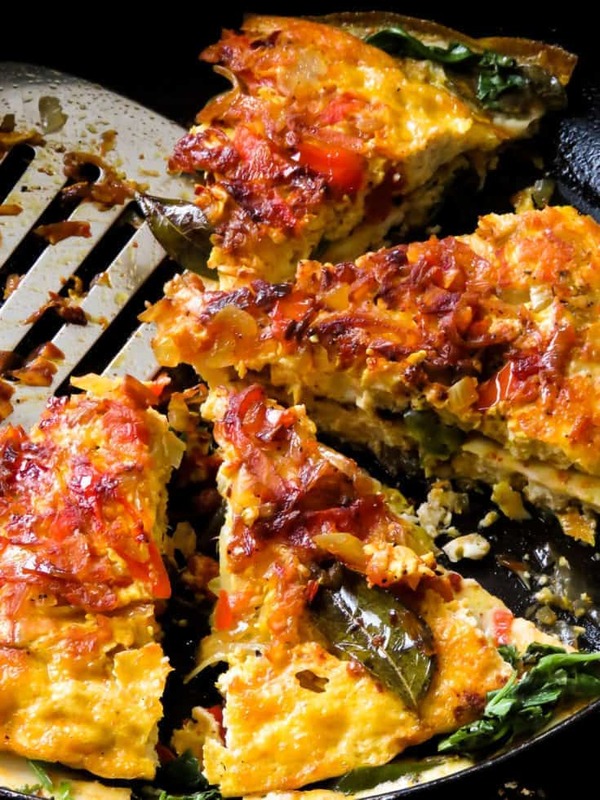 Once you’ve made this spicy Sri Lankan omelet, you’ll notice it’s not fluffy like your regular french omelets. No this Sri Lankan version of the omelet has a crispy edge which I personally favor. And the reason the spicy omelet isn’t fluffy is that instead of fresh milk I substituted it with a little bit of coconut milk. The younger ones really thought I was serving Pizza for breakfast so maybe you can use the recipe to tempt your little ones, minus the spicy ingredients. Medium sized bowl to whisk the eggs and a frying pan with a lid to assemble and cook the omelet. Here are a few tips that might help you get your omelet just right the first time. 1/ Use a non-stick pan, this helps with the omelet not sticking to the pan and making it difficult to flip or fold. 2/Instead of mixing all the ingredients with the egg, I first cook the onions, green chillies, tomatoes and curry leaves, spread it over the frying pan surface and then pour in the egg mixture. try this method for a change. 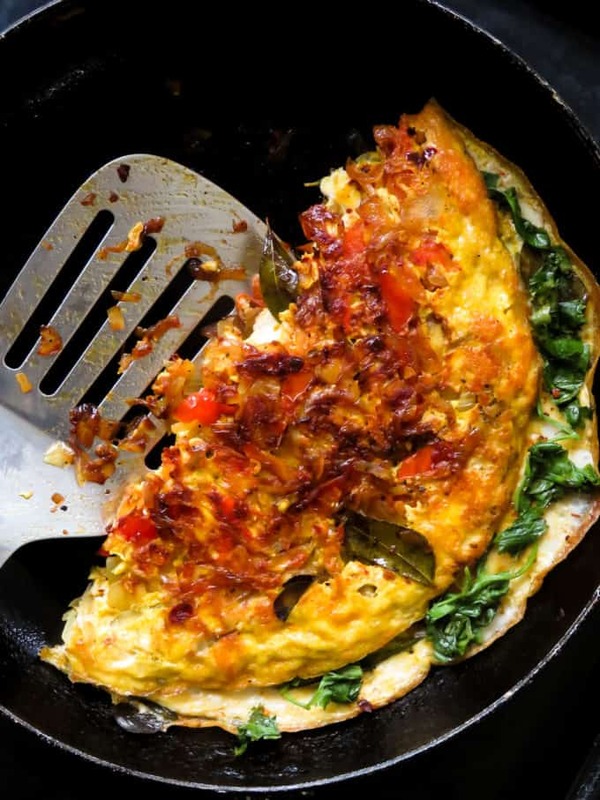 3/Maintain low heat throughout the cooking process of making the omelet and cover the pan with a lid once you have all the ingredients in the pan. 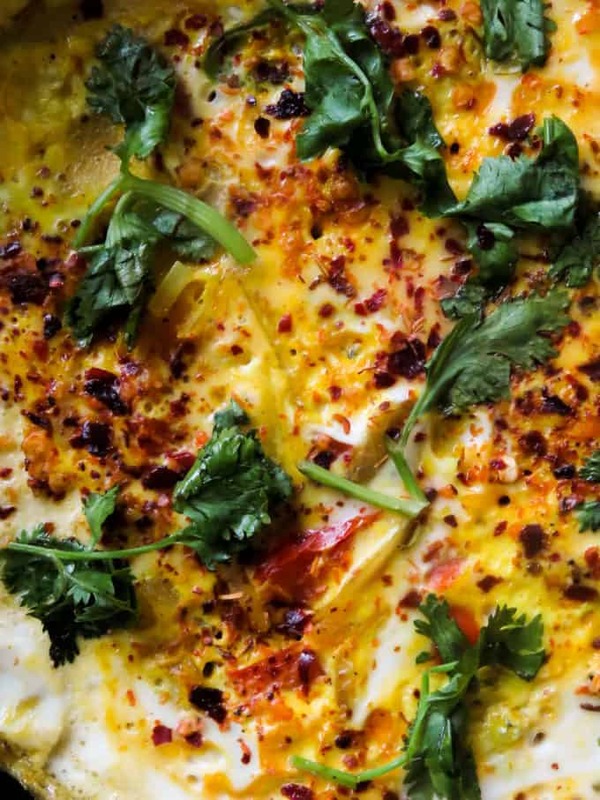 recipe-Sri Lankan spicy breakfast omelet. Have all the ingredients in hand before you begin with the omelet. Crack the eggs in a bowl, add the coconut milk and whisk them together, season with pepper and set aside. Place the pan over low heat and warm it for a few seconds. Pour in the oil and spread it over the frying pan. Add the chopped onions, tomatoes, green chillies, curry leaves, turmeric and chilli flecks. Season the ingredients with salt while the ingredients continue to sauté, cook until the onions and tomatoes turn soft over low heat(3-5 minutes). Once the ingredients are cooked, spread them lightly over the frying pan surface with a spoon, make sure you have the onions, green chillies and tomatoes spread evenly. Once you’ve done the above, pour the egg mixture to the pan(give the eggs a stir before following this instruction), make sure the egg mixture spreads evenly over the cooked ingredients that are already in the pan. Immediately cover the frying pan with a lid, maintain low fire and continue cooking the omelet. Avoid shaking the pan or using a spoon while the omelet cooks. If you find the bottom of the omelet too dry while it cooks, drizzle a bit of oil around the edges of the eggs, this makes it crisper as well. Once the top layer of the omelet is cooked, add your favorite herb, I’m adding chopped coriander here. Now gently, fold the omelet in two, you will notice that the onions have really caramelized which is what you’ll want. If you feel both sides needs to be cooked further, go ahead and flip the omelet gently so the omelet is done exactly the way you love it. Serve warm. Similar egg dishes you might like to try. Easy Sri Lankan egg curry. Curried egg stir-fry with caramelized onions. Breakfast skillet of poached egg in chickpeas and tomato sauce. If you feel both sides needs to be cooked further go ahead and flip the omelet gently so the omelet is done exactly the way you love it. Serve warm. I never cooked anything like this before. Wish me luck! Thanks for sharing your recipe!